Shooting Gallery in SF this year celebrates its 11 year anniversary with a group exhibition titled An Even Eleven. The exhibition is also a celebration of artists who have worked or will work with the gallery in the future. It will be an interesting display of gallery’s favorite works by influential artists that have changed the face of urban contemporary art. The opening is scheduled for March 15. The exhibition will be on view through April 5. 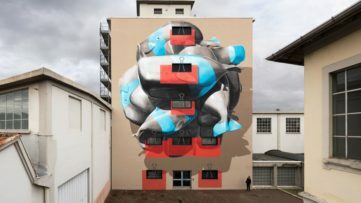 The lineup of artists is impressive and it includes: Eine, Duncan Jago, Andrea Heimer, David Soukup, Vhils, Tes One, Mary Iverson, Niels Shoe Meulman, Victor Castillo, Marco Rea, Amanda Marie, Meryl Pataky, Ernesto Yerena, Adam Ziskie, Sten & Lex, Greg Gossel, Jeremiah Kille, Remi Rough, Mark Warren Jacques, Lauren Napolitano, Mike Shine, Melanie Alves, Kelly Tunstall, Ted Lincoln, Ferris Plock, Word To Mother, Brock Brake, Spencer Keeton Cunningham, Rone, Poesia, Anthony Lister, Casey Gray, Cleon Peterson, Bec Winnel, Charmaine Olivia, David Marc Grant, Ben Clarke, Dan Tague, Faith 47, Chazme, Helen Bayly, Apex, Peter Gronquist, Mike Davis, C215, Robert Christian Malmberg, Sergio Garcia, C3, Porkchop (Michael Lavalee), Mauricio Garrido, The Clayton Brothers, Yumiko Kayukawa, Joseph Martinez, Cyrcle, Justin Kerson, The Low Bros, John Felix Arnold III, Sergio Lopez, Jon Fox, Pixel Pancho, Cope 2, Indie 184 and Christopher Burch. Here is a brief overview of several attending artists we highlight. After attending art school for illustration, UK’s artist entered into the art world. Word To Mother creates work that combines many influences. 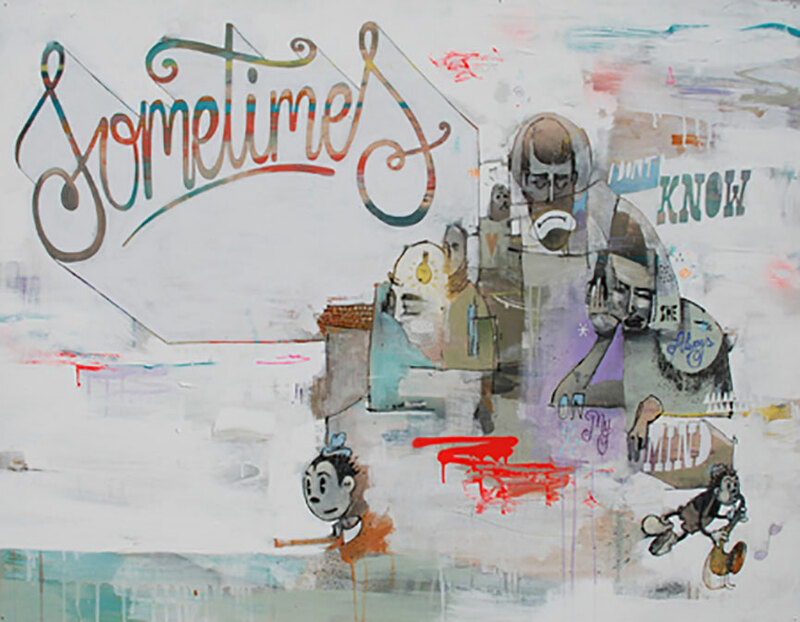 He incorporates different forms of script and written letters into his layered paintings and sketches of soft colors, drawn from years of painting graffiti and tattooing. Rone is a famous street artist from Melbourne who began his career in skate parks and now exhibits in various galleries internationally. He is well-known for his paintings of glamorous women. Producing many of his early works either through a process of stenciling or screen-printing, Rone’s art is now moving toward a more freehand style of practice. Anthony Lister is an Australian-born painter and installation artist. 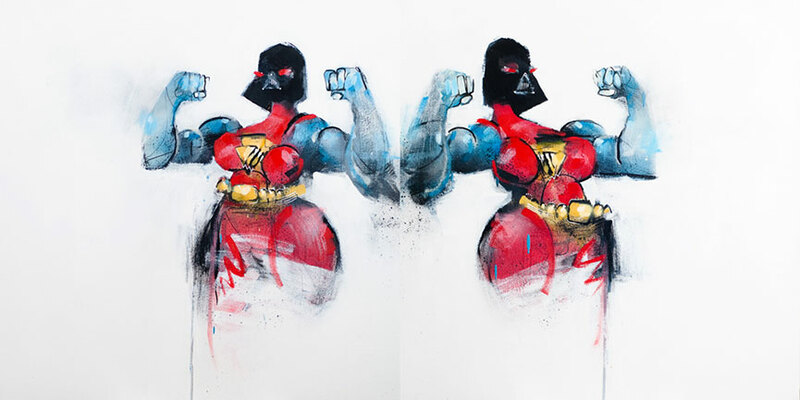 His work is a fusion of high and lowbrow culture with influences from a number of areas and genres, including street art, expressionism, pop art, and television. 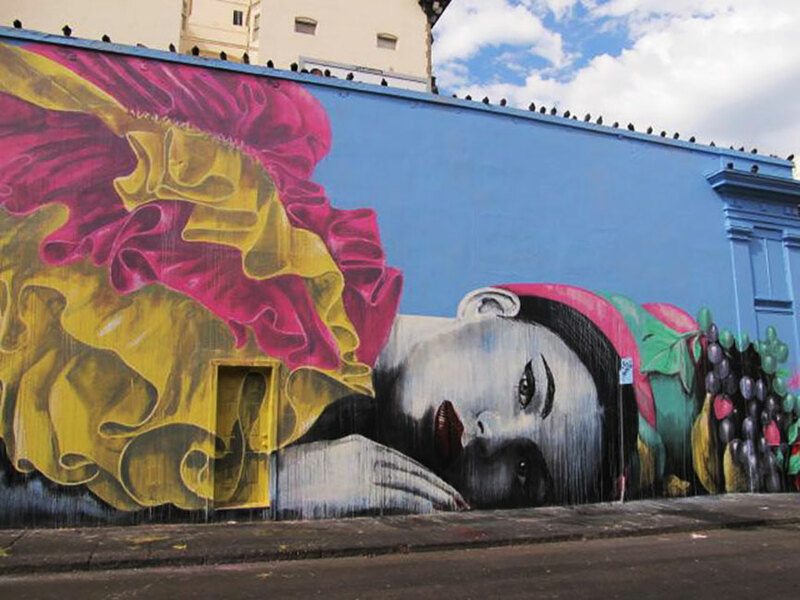 Faith47, a South African graffiti self-taught artist based in Cape Town, is known for her socially engaged murals. 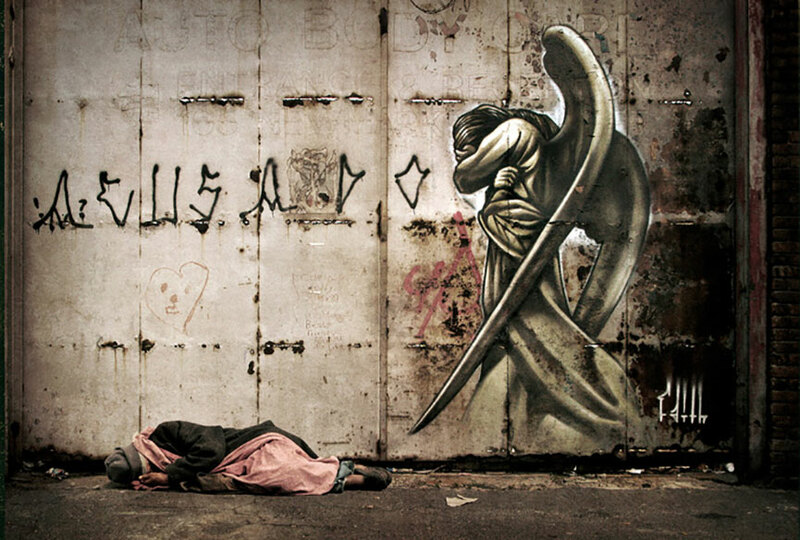 Faith47’s early work was inspired primarily by the social realities in her country. She was interested in juxtaposing the vast difference between the promises of a better life and the harsh reality of the lives of most South Africans. In later work, the human condition and our relationship to animals and nature are the themes that are more recurring. Christian Guémy, also known as C215, is a street artist known for his close up portraits of people. 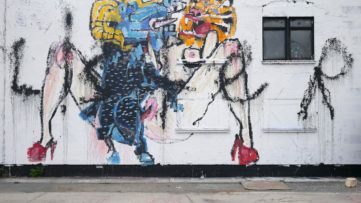 In his art, he is trying to turn all the anonymous into icons by depicting people who live on the streets of a city, like homeless people, street kids and refugees. 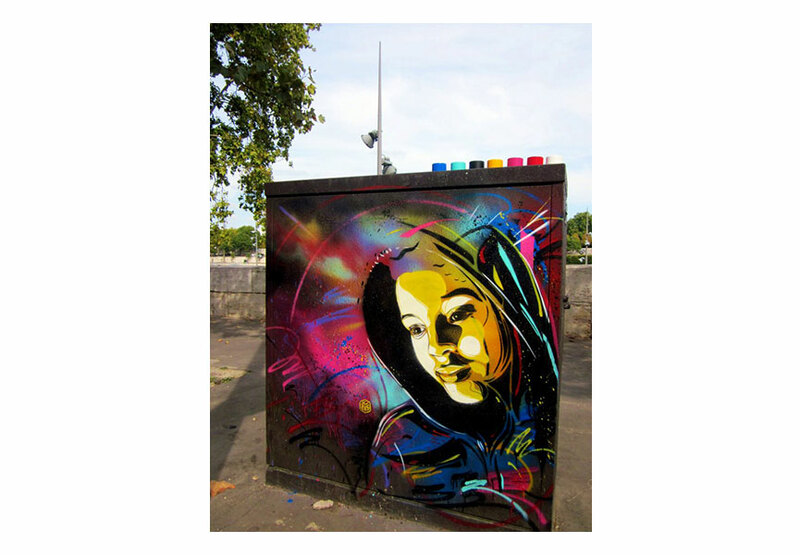 C215 has been described as “France’s answer to Banksy”. 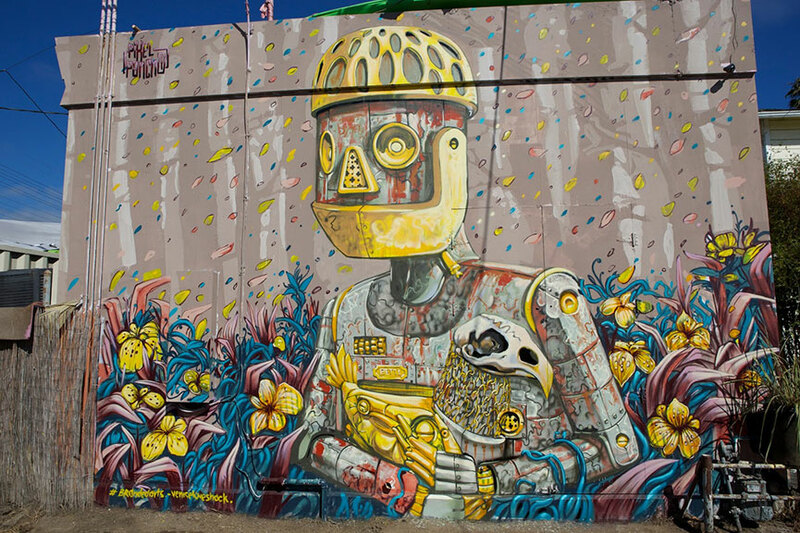 Pixel Pancho is an Italian street artist specialized in large wall murals with distinctive robotic imagery. Pixel creates robotic creatures inspired by different environments. The artist uses a wide variety of mediums such as: tiles, wall painting, sticker/poster art and more. Fernando Carlo (aka Cope2) has been a graffiti artist since around 1979-80 when graffiti writing on the New York subways was taking off. Though he is now known worldwide as being a general founder of graffiti, he didn’t receive recognition in the mainstream graffiti world until the mid-1990s when his cousin Chico 80 influenced Cope2 into writing. Cope2 is well known for his “throw-up” and as one of the users of “wildstyle” graffiti, a style which originated in the Bronx. 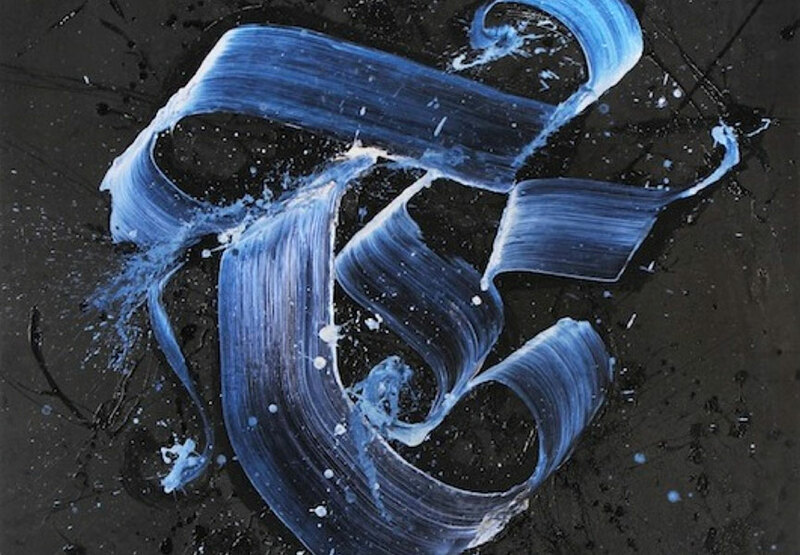 Today, you can catch Cope2 in his studio, bringing his raw energy into abstract masterpieces. 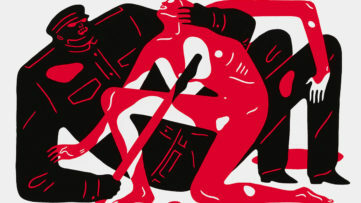 Two Legends, Two Cities, One Gallery – Zevs and Cleon Peterson at Over The Influence!